BACK IN the Spring of last year NVT introduced a new trail bike to an already very competitive off-road machine market and waited to see how it would sell. 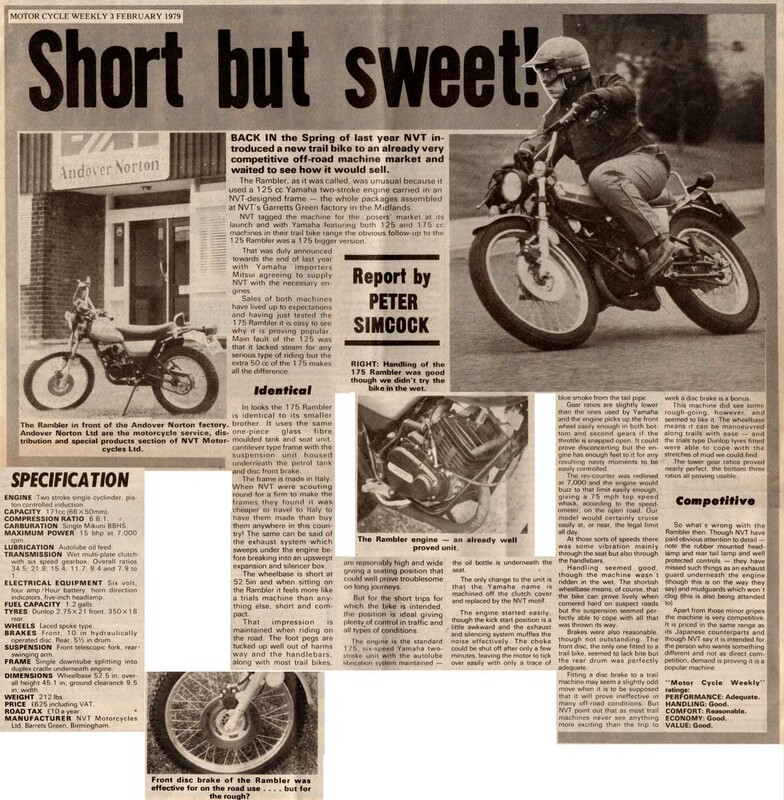 The Rambler, as it was called, was unusual because it used a 125 cc Yamaha two-stroke engine carried in an NVT - designed frame - the whole packages assembled at NVT's Garretts Green factory in the Midlands. NVT tagged the machine for the 'posers' market at its launch and with Yamaha featuring both 125 and 175cc machines in their trail bike range the obvious follow-up to the 125 Rambler was a 175 bigger version. That was duly announced towards the end of last year with Yamaha importers Mitsui agreeing to supply NVT with the necessary engines. Sales of both machines have lived up to expectations and having just tested the 175 Rambler it is easy to see why it is proving popular. Main fault of the 125 was that it lacked steam for any serious type of riding but the extra 50 cc of the 175 makes all the difference. In looks the 175 Rambler is identical to its smaller brother. It uses the same one-piece glass fibre moulded tank and seat unit, cantilever type frame with the suspension unit housed underneath the petrol tank and disc front brake. The frame is made in Italy. When NVT were scouting round for a firm to make the frames they found it was cheaper to travel to Italy to have them made than buy them anywhere in this country! The same can be said of the exhaust system which sweeps under the engine before breaking into an upswept expansion and silencer box. The wheelbase is short at 52.5in and when sitting on the Rambler it feels more like a trials machine than anything else, short and compact. That impression is maintained when riding on the road. The foot pegs are tucked up well out of harms way and the handlebars, along with most trail bikes, are reasonably high and wide giving a seating position that could well prove troublesome on long journeys. But for the short trips for which the bike is intended, the position is ideal giving plenty of control in traffic and all types of conditions. The engine is the standard 175 six-speed Yamaha two-stroke unit with the autolube lubrication system maintained - the oil bottle is underneath the Seat. The only change to the unit is that the Yamaha name is machined off the clutch cover and replaced by the NVT motif. The engine started easily, though the kick start position is a little awkward and the exhaust and silencing system muffles the noise effectively. The choke could be shut off after only a few minutes, leaving the motor to tick over easily with only a trace of blue smoke from the tail pipe. Gear ratios are slightly lower than the ones used by Yamaha and the engine picks up the front wheel easily enough in both bottom and second gears if the throttle is snapped open. It could prove disconcerting but the engine has enough feel to it for any resulting nasty moments to be easily controlled. The rev-counter was redlined at 7,000 and the engine would buzz to that limit easily enough, giving a 75 mph top speed whack, according to the speedometer, on the open road. Our model would certainly cruise easily at, or near, the legal limit all day. At those sorts of speeds there was some vibration mainly through the seat but also through the handlebars. Handling seemed good, though the machine wasn't ridden in the wet. 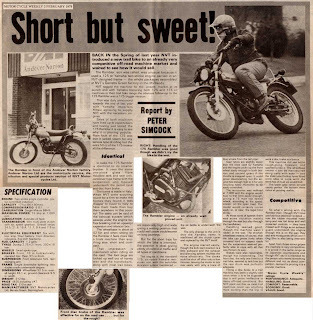 The shortish wheelbase means, of course, that the bike can prove lively when cornered hard on suspect roads but the suspension seemed perfectly able to cope with all that was thrown its way. Brakes were also reasonable, though not outstanding. The front disc, the only one fitted to a trail bike, seemed to lack bite but the rear drum was perfectly adequate. Fitting a disc brake to a trail machine may seem a slightly odd move when it is to be supposed that it will prove ineffective in many off-road conditions. But NVT point out that as most trail machines never see anything more exciting than the trip to work a disc brake is a bonus. This machine did see some rough-going, however, and seemed to like it. The wheelbase means it can be manoeuvred along trails with ease - and the trials type Dunlop tyres fitted were able to cope with the stretches of mud we could find. The lower gear ratios proved nearly perfect, the bottom three ratios all proving usable. So what's wrong with the Rambler then. Though NVT have paid obvious attention to detail - note the rubber mounted headlamp and rear tail lamp and well protected controls - they have missed such things as an exhaust guard underneath the engine (though this is on the way they say) and mudguards which won't clog (this is also being attended to). Apart from those minor gripes the machine is very competitive. It is priced in the same range as its Japanese counterparts and though NVT say it is intended for the person who wants something different and not as direct competition, demand is proving it is a popular machine. ENGINE Two stroke single cylinder, piston controlled induction. CAPACITY 171cc (66 X 50mm). MAXIMUM POWER 15 bhp at 7,000 rpm. TRANSMISSION Wet multi—plate clutch with six speed gearbox. Overall ratios 34.5; 21.8; 15.4; 11.7; 9.4 and 7.9 to 1. ELECTRICAL EQUIPMENT Six volt, four amp/Hour battery, horn, direction indicators, five-inch headlamp. TYRES. Dunlop 2.75x21 front, 3.50x18 rear. BRAKES Front, 10 in hydraulically operated disc. Rear, 5 1/2 in drum. SUSPENSION Front telescopic fork, rear swinging arm. FRAME Single downtube splitting into duplex cradle underneath engine. DIMENSIONS Wheelbase 52.5 in; overall height 45.1 in; ground clearance 9.5 in. ROAD TAX £10 a year. MANUFACTURER NVT Motorcycles Ltd, Garrets Green, Birmingham.